Hi everyone, it’s Katie again! Next week we’ll be back to our regular schedule of each doing one post a week and a collaborative post on Friday, but for this week you not only get a double dose of me, you also get this terrible and punny post title (please forgive me). I recently got the nun decanter (is that a thing?) at a thrift store for a couple of dollars. Good score! I’ve always loved the way art looks against dark walls, and long before I painted this room I was daydreaming about what I might hang in there. Now that I can see the color I’m less interested in the large-scale art and murals I was coveting before–I don’t want to cover up the pretty blue. So what am I thinking about? Well here’s a phrase I never thought I’d utter in reference to my own home: decorative plates. The glaze on these plates is unreal. I love the colors and think they would look gorgeous on the deep blue walls. I also love the loose way they have arranged them here. I am also crazy about these plates – the monochromatic palette and the simple drawings are so charming – and I like the irregular shapes and raw edges. 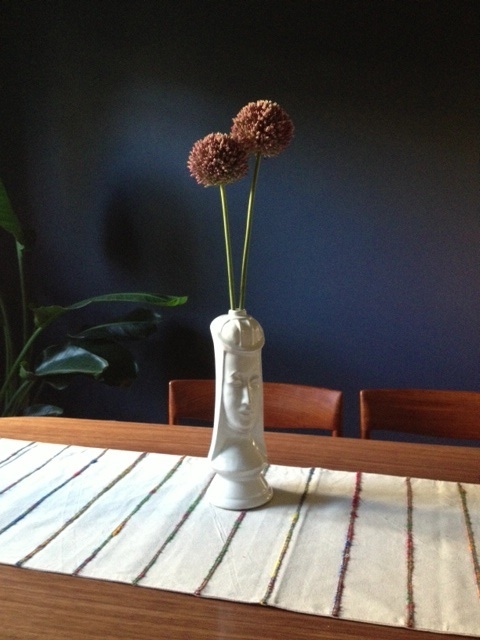 I’ve been toying with the idea of trying to DIY something in this same vein (maybe with paper mache?). I’ve been admiring the combination of paintings on traditional chinaware for a while. I love how cheeky these are. I particularly like the arrangements of the plates in these next three images–there is something very modern about the way all of these collections are displayed. 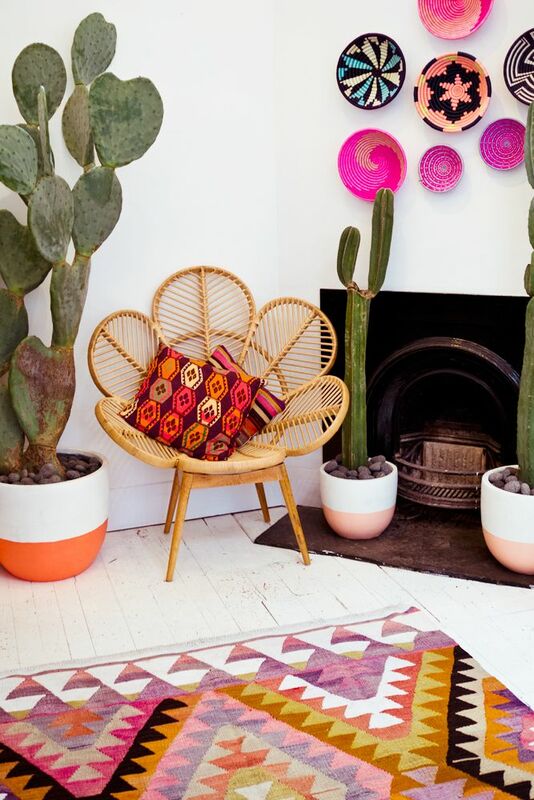 Finally, these colorful baskets are also a beautiful option and would add a welcome punch of color and pattern. I like the mix of sizes and designs. For now I’m happy just enjoying the blue walls as-is, but down the road it will be fun to experiment with bringing other elements into the room. What do you think? 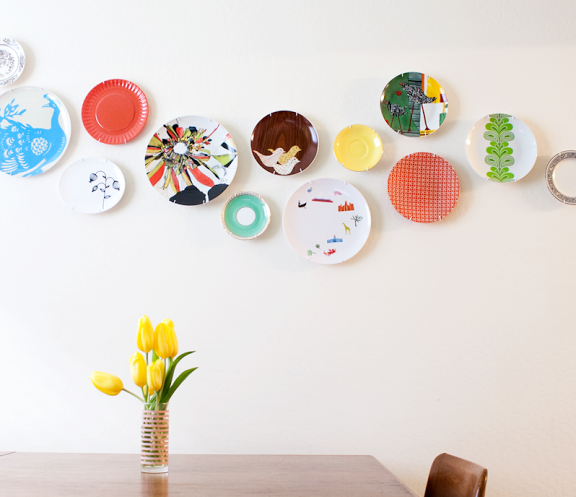 Would you (or do you) hang plates as decoration in your own home? Which of these options is your favorite? rich/elegant looking with Karastan style rugs and dark wood. 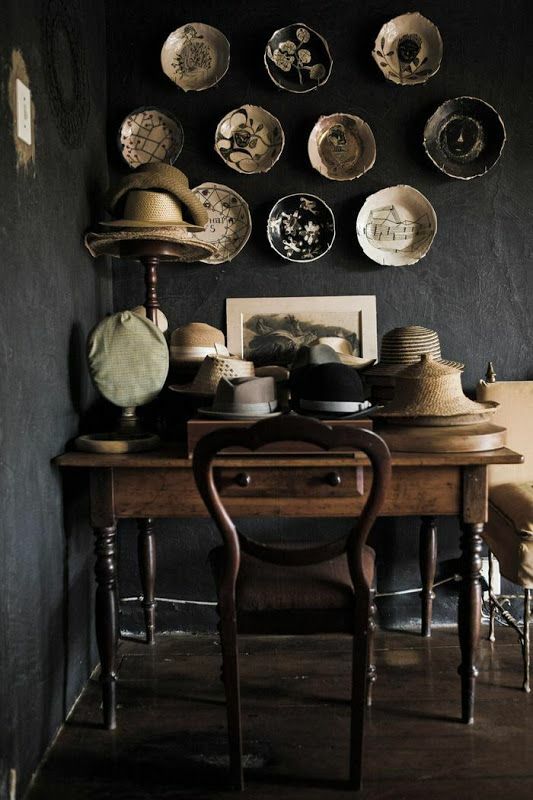 At this point in my life I would not go for the small item wall arrangements of basket or plates. So much dusting doesn’t work for me. I would select one gorgeous piece of wall art to be the wall focus and this could either be a framed piece or a free form wall textile. Love following what you do next! My mother was an avid “plate hanger.” She even hung one of those plastic plates with scribbles all over it that my son made in preschool. Her favorite set of china plates was made in England. They were hand-painted with funny scenes of hunters on horses jumping obstacles and falling into streams or mud puddles. 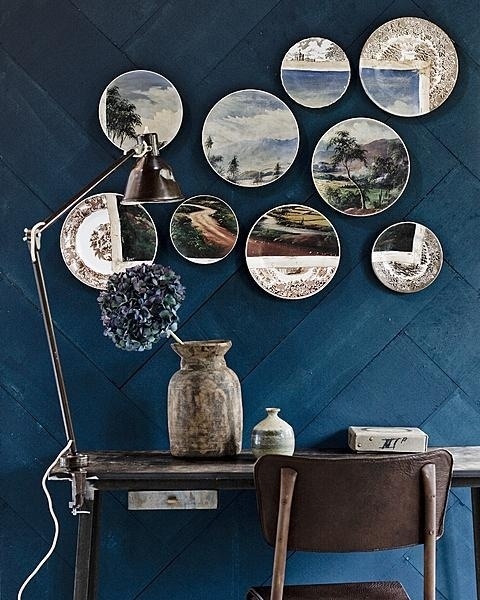 Plates would look great on your blue walls. I can see what you mean about not wanting to cover up the blue, and I loved seeing all those arrangements you use to show us what you might do. Thanks Carol! My mom had one of those plates I made as a kid hanging in her kitchen for years, and I was always proud of it. 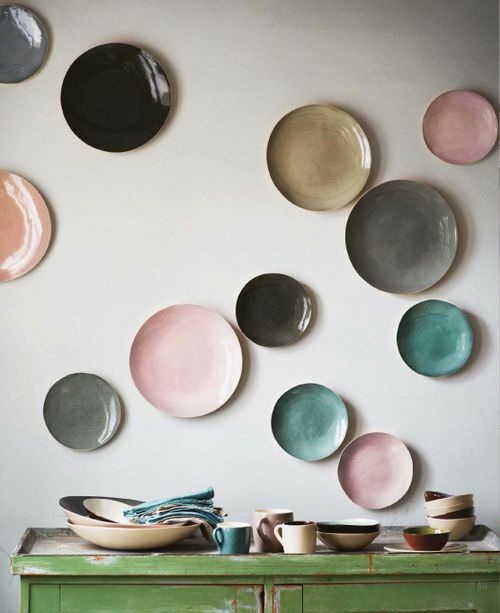 I love the more modern variations of plates as decoration, although I think I’d be reluctant to cover up those gorgeous blue walls! I love the third “via” plate collection…the variety of patterns, colors, and whites would fit well with the decor throughout your home. I love the blue walls too. They are so wonderfully rich and radiant. 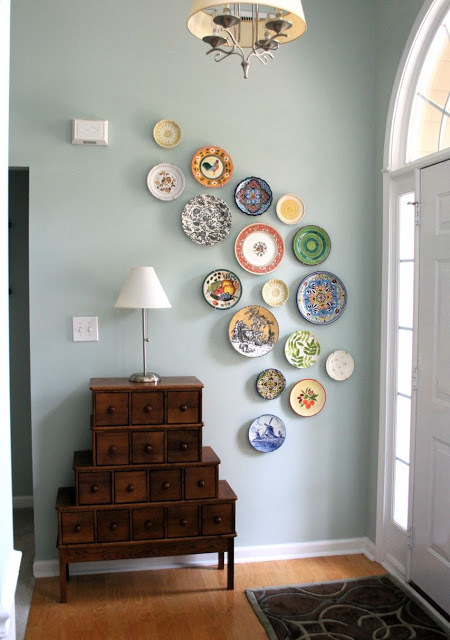 You could also mix a little art and plates. . .more treasure hunting ahead! I love the blue, the new chairs, the fabric you chose, the whole shebang. I will be very interested to see what direction you go in, plate-wise. 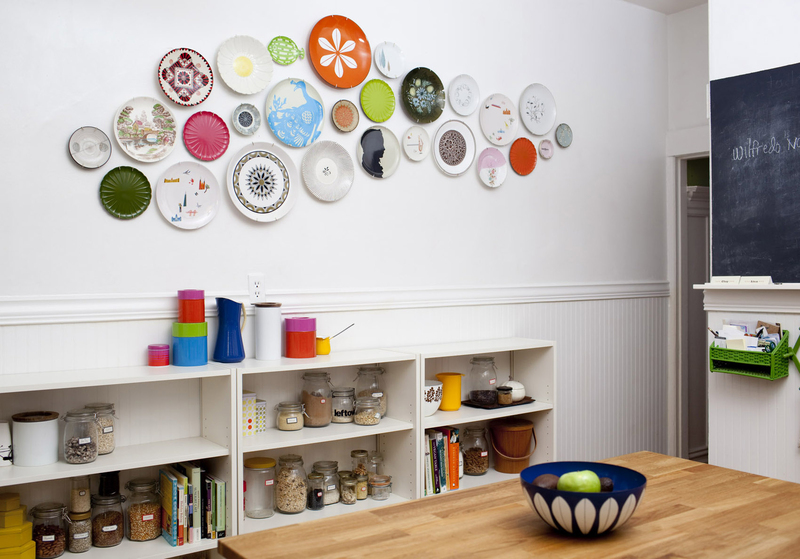 I, too, have recently decided on hanging plates on a wall in our kitchen, over a peninsula. I already have hanging there some art from my late parents’ home: a menu we made up for them when they celebrated their 50th anniversary (my mom was a fabulous cook and my dad her biggest fan; we set up the menu with each kid and grandkid listing their favorite dishes of my mom’s. It sounds super corny but it came out really nice and is, of course, a sentimental treasure.) and a map of Italy with the town bearing our family’s name highlighted, a gift from my dad to my mom one Christmas. But the wall needs some “beefing up” and the idea of plates came to me. So I have decided Italian plates are the way to go – – and there sure are plenty of great options out there. I’m having fun hunting and planning!